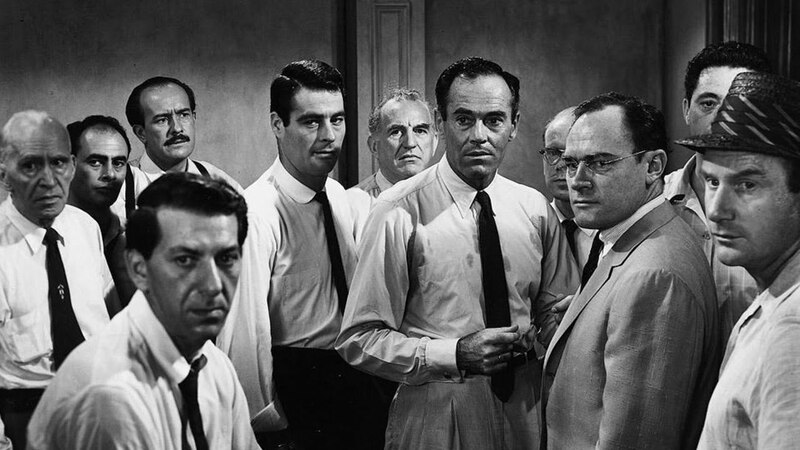 Sidney Lumet’s 1957 theatrical debut offering currently occupies the number 5 slot in IMDb’s Top 10, perched neatly above such illustrious entries as Schindler’s List and Pulp Fiction. It’s the oldest film in that group, the shortest, the only one entirely shot in black and white (if only because of a girl in a red coat) and also the one that fewest people would guess was there if they even knew it existed at all. Nobody went to see it when it was released at the cinema; it didn’t make a profit and Henry Fonda never even collected his salary. So, why is it there? The answer really is quite straightforward: it’s one of the most perfect examples of how beautiful a film can be if it focusses on story, character and conflict. The story is simple: a young man has been accused of the murder of his father and it is up to the twelve unnamed members of the jury to decide on his fate. Eleven of them raise their hands quickly to send him to his death in the electric chair; one of them has doubts. If you haven’t already seen it, here are twelve reasons why you should. 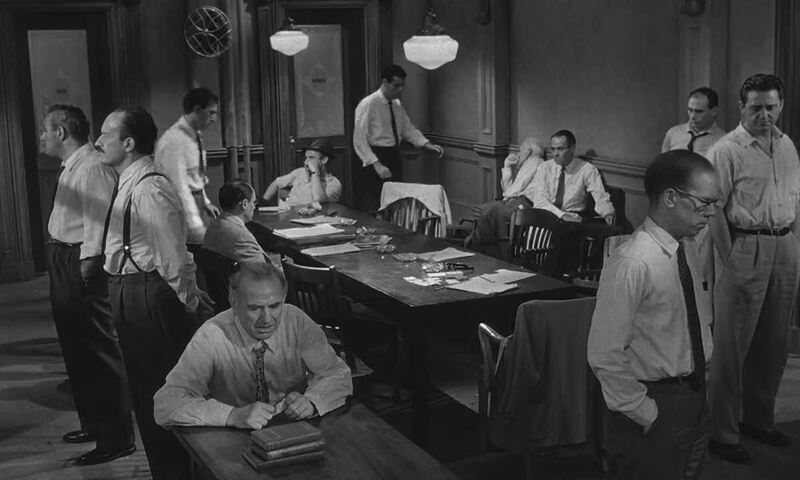 Almost the entirety of the film’s 96 minute run time takes place in the stifling hot confines of the jury room: a very drab space with a table and chairs, a broken fan, a water cooler and not much else. The characters are packed in tightly and kept in place by their duty and an armed policeman outside the door. Think of that moment in any submarine movie – you know the one – when the whole crew are clinging on to each other for dear life, waiting to see if the depth charge that’s been dropped off a searching ship above will destroy them all. 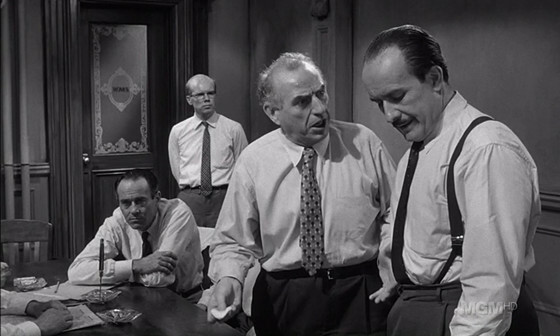 In 12 Angry Men, that depth charge is in the room with them and all the doors are locked. 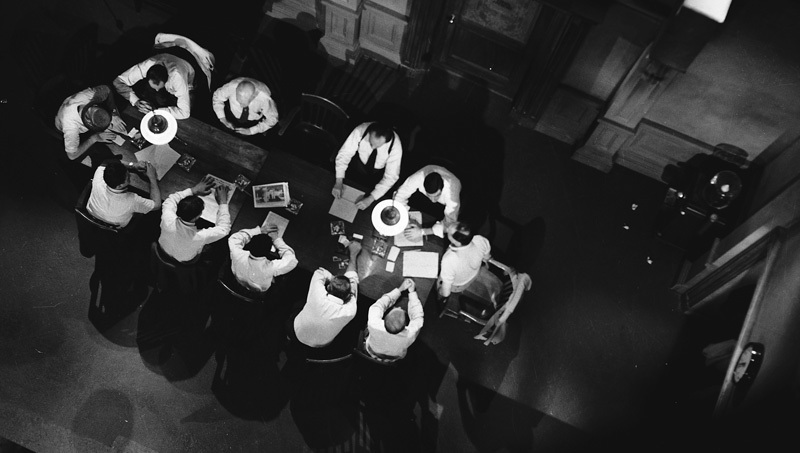 The twelve jurors have no-one to cling to because they are not a crew. Their only hope is to try to forge alliances with one another in order to shield themselves from the inevitable blast. The pressure cooker atmosphere is palpable, evidenced by beads of sweat forming on more of the jurors’ foreheads as time moves on and tempers fray. Working with Lumet, cinematographer Boris Kaufman, who had previously won an Academy Award for his work on Elia Kazan’s On The Waterfront, begins with everything feeling so comfortable. There are wide shots of the jury as they enter the room and make small talk. The viewer sees them as a reasonable group: objective, average, unthreatening. As we move through the rollercoaster of emotions of the film, however, the camera itself seems to shadow the ups and downs of the story. It goes from a high vantage point to the eye level of the characters, finally sinking below that as we are pulled down into the struggle; the wide objective view of the beginning narrowing inexorably into close ups detailing the frustration and passion of the players. 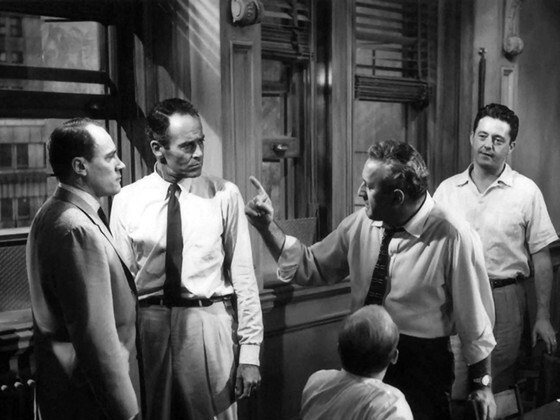 Henry Fonda is the big name in the group but his performance is secondary to that of the group as a whole. It’s very rare to come across a film where there is not a single misstep from any of the cast. Each actor brings their best and makes full use of the opportunities they have within their roles. Most of the cast were known primarily for their work in television. Even heavyweights like Lee J. Cobb and E.G. Marshall had their share of TV credits at the time of filming. They were kept in the room together for hours on end in weeks of rehearsals that were not even filmed, just so they would have experience of how claustrophobic an atmosphere their characters would inhabit. 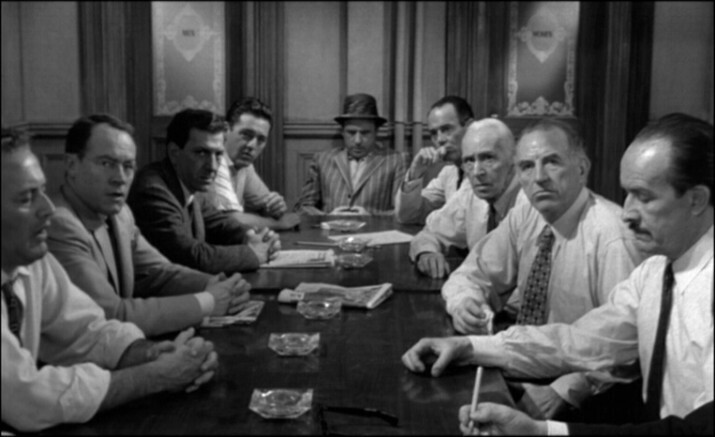 Even though the legal aspects of some of the events that transpire in the jury room are beyond what would be acceptable (the introduction of the knife, the speculation about the woman’s glasses), the film has been held up by the American Bar Association as a model for the workings of the justice system. High ranking members of the judiciary cite it as the reason for their first interest in the law and it is widely used in schools as a catalyst for discussion on the themes at its heart. 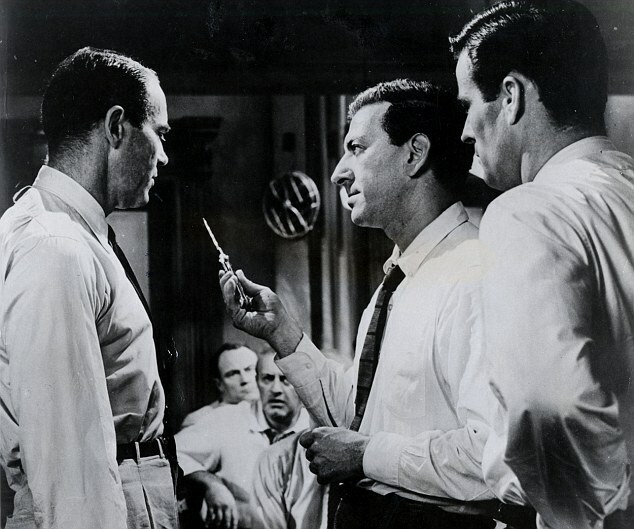 The trick of the film is that you may reach the end and feel that the defendant must have been innocent. As some time passes, however, the details of the case seep back in and you realise that on the balance of probabilities he probably did it. The concept of reasonable doubt may have let a murderer go free but isn’t that preferable to seeing an innocent man die? How refreshing it is to see a different aspect of the workings of the judiciary. This is such a tired, overworked sub-genre these days. From every John Grisham novel to every episode of Perry Mason there is more and more of the same. It is lovely to be able to acknowledge that even long before the genre was spread so thin and worn out so utterly, a film was willing to explore a different aspect of the system. There are no ‘objections’ here, no last minute witnesses and no lawyers’ cross-examinations. There are just the passionate deliberations of the jury. The audience has to put together all that has gone before through their eyes and their bias. Many of the prejudices that plague our society are laid bare in the confines of this jury room. Although the cantankerous bigotry of Ed Begley’s garage owner is the most obvious, the piece is rife with other examples. We have derision against the elderly directed both at Joseph Sweeney’s wise old Juror no. 9 and the resident witness in the apartment below the crime scene. There is prejudice against foreigners, against class and profession all unearthing itself in the midst of the heated debate. The joy of this is that every time a character’s prejudice comes to the fore, it is challenged by others. The beauty of the script and the direction is that this is always done in such a matter of fact way. A quip or a retort is given to shut down the person who has stepped out of line and the story moves on. The best example of this, perhaps, is Ed Begley railing against the defendant, calling him ignorant and saying that “he don’t even speak good English.” All it takes is the one person in the group who is not a native English speaker to correct him and the point is made.